The Grand Scenic is Renault’s midi-MPV designed to seven in comfort. The car boasts quality build and a quality interior design as well. The Grand Scenic shouldn’t have any problems luring buyers away from rival brands. The 1.9 dCi is the best choice of engines. The engine provides plenty of power, provides a refined ride and good fuel economy. Handling is excellent and body roll has been improved over past models. Cabin space is also excellent for all three rows of passengers. Even the rearmost passengers enjoy plenty of leg and headroom. The Grand Scenic also provides adequate space for luggage as well. The Grand Scenic enjoys the highest safety ratings in it class. The car’s safety will carry a lot of weight with family buyers. Add in the fact that the car seats seven and families will have a hard time walking away from all that the Grand Scenic has to offer. The Grand Scenic delivers a good all-round package. It can haul people and is versatile enough to carry cargo both large and small, and the Grand Scenic delivers a smooth and refined ride. These things combine to create high levels of comfort. The Renault Grand Scenic should prove to be an inexpensive car to own and operate. Insurance rates and servicing costs should be low as well. The Grand Scenic should prove to be reliable. The Grand Scenic provides excellent space and comfortably seats seven. The cabin is spacious enough to accommodate passengers and their luggage quite comfortably. The boot is large and seats can be adjusted to create better cargo space. The car’s steering-wheel adjusts for reach and rake; the car’s instrumentation is easy to use. The displays are large and easy to read. The car’s steering-wheel mounted controls are convenient and functional. The car delivers excellent levels of comfort. The seats are comfortable even on longer journeys; even the rearmost seats are comfortable. Cabin space ensures that passengers don’t feel cramped, and storage space ensures that there is adequate space for luggage and other items. The ride is smooth and refined and the cabin provides a pleasant overall environment. The Grand Scenic provides good accessibility. The doors are large and open widely providing a large aperture for easy access. Access is better for front and middle row passengers. Rear seats can be more difficult to access and should be reserved for children. Parking the Renault Grand Scenic is easier than it looks. Despite the car’s large size the Scenic handles well and is easy to maneuver at low speeds. The car’s large side mirrors help out a lot when reverse parking. The Grand Scenic wasn’t designed for performance but it does provide enough power to provide a very smooth and comfortable ride. Handling is excellent and the Grand Scenic is an easy car to drive even through crowded streets. This is a perfect family vehicle. The Grand Scenic offers high levels of comfort, a stylish exterior design and loads of cabin and cargo space. The Grand Scenic could hold family size loads without intruding on passenger space. The Scenic also scored the highest safety ratings in its class. This absolutely is not a good first car. The Grand Scenic is too large and too expensive for most first time buyers. The Scenic is easy to drive but may be difficult for novice drivers to maneuver around town. 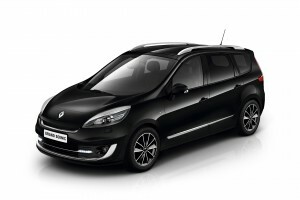 Renault has produced a variety of vehicles that are able to meet the needs of various buyers. The Grand Scenic is marketed toward family buyers and should market itself quite successfully. Rival brands will have a tough time beating the Grand Scenic’s prices and practicality. The car’s standard security features include remote central locking and deadbolts. The Grand Scenic is not likely to appeal to thieves, but a visual deterrence may be desired for additional security. The car’s safety features include the whole array of airbags, ABS and has received a five star rating from the Euro NCAP. The car’s safety ratings will appeal to family buyers and will raise the bar for the competition. The car’s standard audio unit provides good sound quality. The units controls are large and easy to use. The unit’s display is also large and easy to read. The Grand Scenic boasts excellent interior and exterior quality. The car should enjoy good resale values and equipment levels are good on even on lower spec models. The Grand Scenic provides excellent comfort and practicality. Families will have more than adequate passenger and cargo space. The car’s interior should be durable and withstand the abuse that children can dish out. The car’s ride is smooth and refined adding to the already high levels of comfort. The Scenic is a safe vehicle and is designed with family motoring in mind.